The HOA's landscape assets are probably the most visible to Members. By contract with the City of Glendale, the HOA is responsible for the maintenance of landscaped parkways and medians on Utopia, 79th Avenue, the west side of 75th Avenue and the north side of Union Hills adjacent to Arrowhead Ranch Phase II. 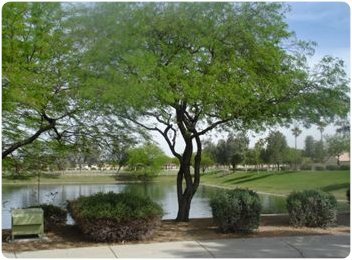 The HOA is also charged with maintaining other HOA owned property such as the lakes, drainage and lake access easements. We contract with Tierra Madre Landscape Services for landscape and irrigation maintenance services. irrigation water pumps and a controll panel. Effluent water is used for irrigation. The effluent water used is provided by the City of Glendale through contract with Arrowhead Amenities. Arrowhead Ranch Phase II, like about 15 other HOAs in the Arrowhead Ranch area, are members of Arrowhead Amenities and by contract we are obligated to use or store the effluent produced by the city. Our 2010 landscape budget is about $150,000. An investment well worth protecting and one that is critical to the appearance of our community.